Divine Legs – A Summer Essential! 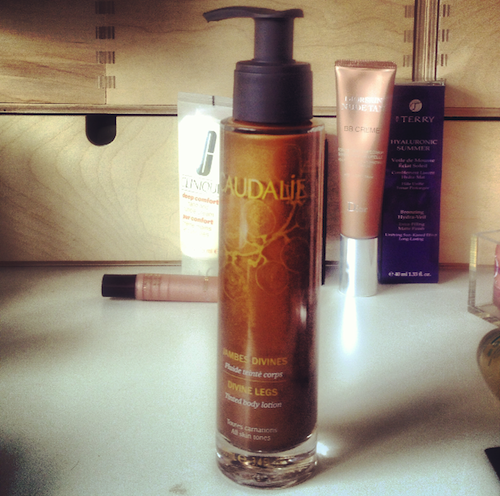 Well I have to say that Caudalie’s Divine Legs really does live up to its name. The colour, texture and smell of this tinted body lotion are all absolutely gorgeous. I find that many wash-off tans are difficult to use and need to be diluted with a proper body lotion to give a smooth application – with the Divine Legs, Caudalie have done the work for us. This is the kind of formula that I dream of – no streaking, no blotching, no settling into the dry patches. It just glides on and with a few seconds of massaging in, you have a beautiful bronzed colour. Please examine Exhibit 1, the photograph above. 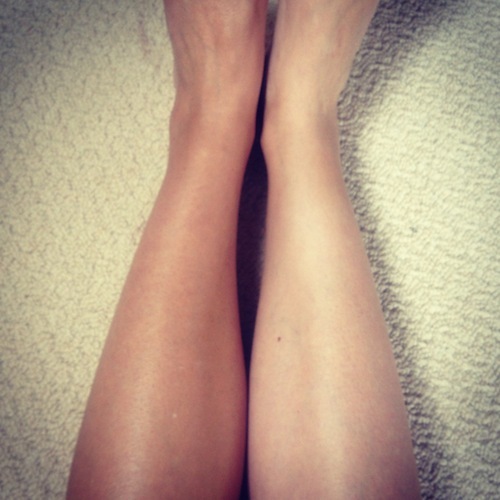 It shows the difference in colour when the lotion is applied – obviously, left leg has Divine Legs applied, right leg doesn’t. Don’t you think it’s a wonderful colour? Very believable! And, of course, application isn’t limited to the legs – though for most of us, it’s the pale and pasty lower leg that usually needs the most help! I have found, as I get older, that my shins tend to tan slower than the rest of me and so it’s nice to be able to give them a quick perk-up before leaving the house. This lotion is pretty much mess-free, though you need to thoroughly wash your hands afterwards. I haven’t found it to transfer onto clothing, but I’d be cautious wearing white. Mind you, I’m cautious doing anything if I wear white – wearing white is like holding up a red rag to the bull that is fate. Within two minutes of donning a white garment, you can guarantee that the heavens will crap all over you. Someone will cycle past you holding a lidless pan-ful of pasta sauce, or a tree that has stood perfectly solidly for three hundred years will suddenly fall over, sending great clods of mud up into the sky. Those wearing dark colours will inexplicably not be affected; those wearing white will be mud-magnets. Anyway, this lovely tinted body lotion will get lots of use this summer. I do like the skin-finishing oils that have a bit of shimmer (The Body Shop actually do a pretty nice one in their Honey Bronze range) but the Divine Legs is convenient in that it dries fully and leaves no residue at all. The colour is long-lasting (stays put until you wash it off) and would suit most skin tones, I think. The lotion looks scarily dark when you first apply, but have faith and keep rubbing it in!